Jelly beans are a classic candy with a soft, chewy center and a thin candy coating. The flavor possibilities are endless, which has led to the ever-growing popularity of this fun, tiny candy. The first known reference to jelly beans was in the late 1800s when William Schrafft, a Boston confectioner, encouraged Americans to send jelly beans to soldiers fighting in the Civil War. By the early 1900s, jelly beans were a common penny candy enjoyed by children and adults alike. It wasn't until the 1930's that jelly beans became associated with Easter, most likely due to their egg-like shape. Jelly beans remain one of the most common Easter candies today. Jelly beans had a boost in popularity in the mid-'60s when then Governor of California, Ronald Reagan, expressed his love for the candy. It is said that Reagan used the candy to help wean himself off of his tobacco habit and always had jelly beans at an arm's reach all the way through his presidency. Jelly Belly, a major jelly bean producer, even created a special blueberry flavor jelly bean for President Reagan. What's In a Jelly Bean? 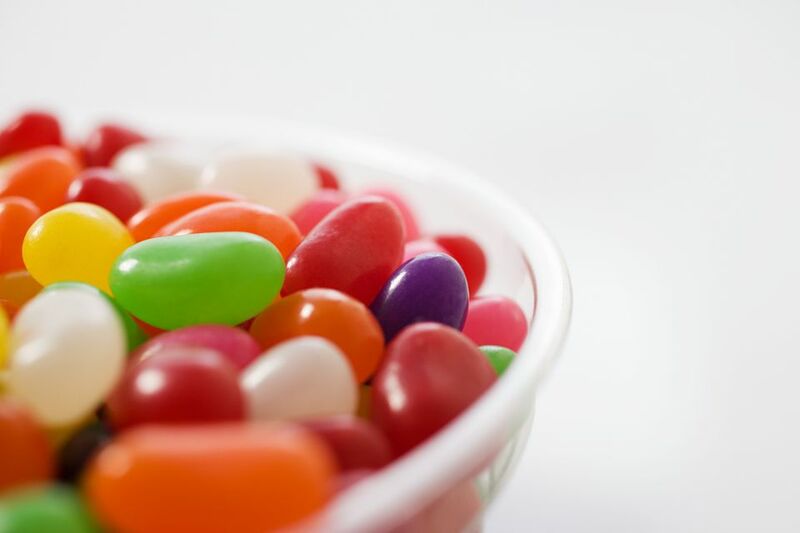 Because jelly beans are a candy, it is no surprise that the main ingredients are sugar, corn syrup, and starch. Starch is added to create the gelatinous, chewy texture. The thin, crunchy coating is achieved with a sugaring technique called panning. This process is the same technique used to create the thin candy coating on other confections, like M&Ms. Flavoring ingredients are added to differentiate jelly bean varieties and may be natural or artificial depending on the manufacturer. A small amount of emulsifying agent is sometimes added to the candy to keep the texture consistent, and edible beeswax may be used to coat the jelly bean to prevent sticking or dissolving in humid conditions. With new flavors of jelly beans popping up every day, their popularity is sure to continue. Each year enough jelly beans to circle the world five times are consumed. Let's see how long it takes to get to six!